1stGen.org • View topic - Assembling my short block into a running engine. Oil pump? Assembling my short block into a running engine. Oil pump? So I got my good short block back from the machine shop, it's sitting in my garage in California. For the first time in two years, I'm going to be back on the mainland for two weeks over Christmas and during this time I'm hoping to get the engine running at least. And hopefully in the truck too, for eventual shipping to the Pacific. Should I replace the oil pump while I have the oil pan off, or are they so indestructible it's not worth the bother? Is there anything else I should replace while I have the engine apart? Theoretically the bearings/ pistons/ cam/ crank are all seated, balanced and tight, with new seals and gaskets. I have aftermarket valve-train components ready to put in. What else do I want to do now that I won't be able to do once it's installed in the truck? What about break-in lube and procedure? Re: Assembling my short block into a running engine. Oil pump? I would replace the side cover gasket on the drivers side, or better yet upgrade to a billet piece...they seem to seal the best from what I have read. Also replace the front and rear crankshaft seals, and make sure to tab the KDB and clean and loctite the case bolts while your in there. As for oil pump....I doubt you'll have any issues there, but that is your choice.....if you feel better having a new one in there then go ahead an swap it, BTW they are not in the oil pan....they are in the timing case. Pre lube etc....I would just crank it by hand a few times then start it up. I don't remember ever reading about an oil pump failure on a 12 valve. 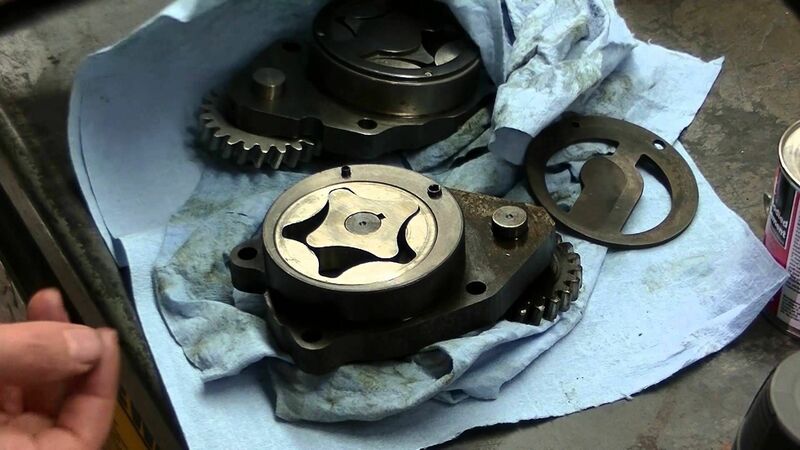 Does the pump gear get swapped with a new pump, or do you pull the pump gear and put it on the new oil pump? I wouldn't want a new gear moving in with old neighbouring gears, I'd assume there'd be a little more friction than the original gear. I doubt that is really even an issue though. I think it was someone on this site that welded some "turds" (no offense intended) onto the tappet cover sealing area to get it to hold the gasket better, not sure how that worked out though. It'd be a good time to do a rear freeze plug coolant bypass, if you think you are going to push it hard enough for that to be necessary. The oil pump is a complete unit....no swapping gears. Just remove 4 bolts, pop the old pump out, then install new one and bolt back in place.....done! Same here I have never come across an oil pump failure. I recently pulled the oil pump from my 89 motor and it looked like it hand circulated sand.....looked rough but I know for a fact that it would pump 50+psi at idle and over 90psi at full throttle. Only oil pump I've seen fail was from consuming a dowel pin with its gears. If you want to upgrade, slip in a 24v pump. While it fits our engine, its rotors are a little longer thus move a higher volume. It will be the entire assembly and since it runs helical gears, there's not an issue with getting along with the neighbors . . . . as I understand things. Further, the assembly includes the associated idler-gear. Thanks David, that seems like some good advice. Do you have a part number for the 24v pump assembly? Who makes a good tab kit? Who makes a good tappet cover? I think I've seen some tappet covers with extra ventilation ports, haven't I? Just make sure you have oil spread throughout the entire engine before cranking it over. I ruined an engine a couple years ago because it didn't get oil soon enough. I assembly lubed everything and held the fuel shutoff while cranking until I had oil pressure. I guess that's not the way to do it though because within a few hundred miles it was gaining valve lash on the last cylinders. A few hundred more and it was knocking so I pulled the engine to find all the cylinders scored. Is there a good way to pre-oil the engine? You can get a pressure pot and push oil in thru the port on top of the filter housing, next to the turbo oil line. That will lube the whole engine. I've rebuilt 2 or 3 of these engines and never had a problem with a lack of oil. I usually just pour some oil in the pickup port on the block before installing the pickup and turn it over a couple turns to fill the pump. By the time I get the fuel bled to the injectors I have oil and just start it up. What's a pressure pot? Like a little squirt can? Zach Hamilton told me after my incident I should put assembly lubed in the oil pump prior to starting it. He said it helps it draw oil faster. Begle1 wrote: What's a pressure pot? Like a little squirt can? What about break-in lube? It's like a brake pressure bleeder is the best I can describe it. A tank you can put fluid in, has a hose to where you are sending the oil, and an air fitting to pressurize the can. When I assemble an engine I put a film of grease on the bearings, regular oil on pistons and rings, and slap it together. I put regular oil in the engine and fire it up. Never used break in lube. fatty wrote: Zach Hamilton told me after my incident I should put assembly lubed in the oil pump prior to starting it. He said it helps it draw oil faster. I ALWAYS prelube oil pumps. That may have been your problem. I learned the hard way too, back in the early '80's. '68 Charger with a 383 big block. Rebuilt the engine, put the pump on (luckily external oil pump on that) with just a few dribbles of oil and fired it up. No oil pressure. Ran it for 4-5 minutes, no oil. Pull the pump, pack it full of STP and put it back on. Fire it up, oil pressure! Fast forward 2 years, screwing around on the Boulevard light to light, hear a tapping noise. Check the gauge, no oil pressure! Shut it off, drain oil in a parking lot and refill with new oil. Nuttin! Tow it home, pull the pump and fill it with STP, and had oil pressure again. I then decided to send it down the road as I couldn't afford to go thru it again. Wish I had that car now. What about break-in oil? Everybody says "no synthetic". Does anybody sell specific "break-in oil" that are worth it? Everybody does seem to agree on using ZDDP additive. Unless you're using a specific-purpose break-in oil.